Let me just start by apologizing for not having any images of my hair. I don't have any for two reasons: 1) I didn't have time after the salon trip as I was late for the CD listening party of the jazz band my brother's in and 2) I didn't like the way my hair turned out. Now that the apologies are out of the way, let's dig into the details. For my touch ups, I go to the salon because I know I don't have the patience to handle the chemicals properly and I'd like to not be bald. The salon I went to was one I'd frequented twice before and had loved how my hair turned out. This time not so much. So much that I'm currently researching new salons. My prep starts the week before with a wash day. My regimen for that wash day is Detangle -- Pre-poo -- Cleanse (clarify) -- Light Protein Treatment (opt.) 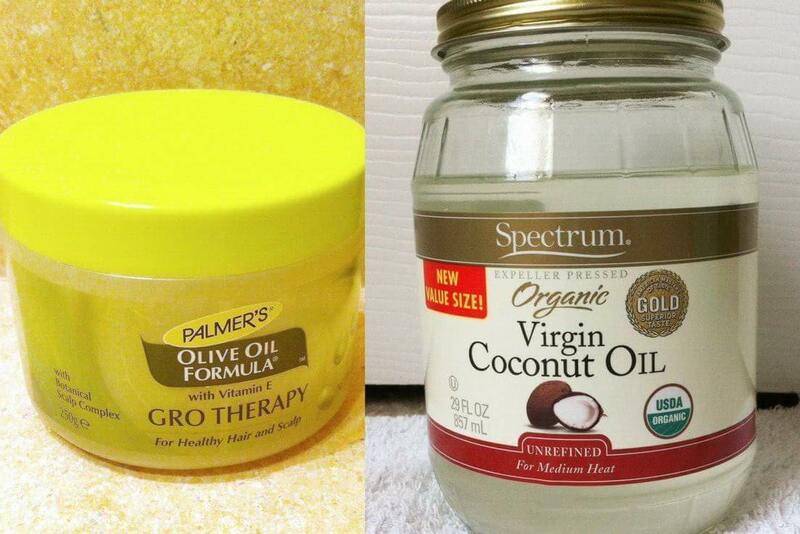 -- Deep Condition -- Moisturize and Seal -- Flat iron new growth. You can read more in my last wash day post. Two days before the touch up I did a detangling session and the day before I based my scalp with Palmer's Olive Oil Formula with Vitamin E Gro Therapy (this was a past purchase that I stopped using other than to base my scalp due to petroleum being an ingredient) and put extra virgin coconut oil on the previously relaxed portion. When I arrived for my 10 am appointment the stylist wasn't there. It seems one of us got the time wrong. When she arrived, she based my scalp with oil and I felt some tugging on my hair as she was parting it. She was using a small toothed comb. This was something she'd never done before. Turns out she didn't have a larger toothed comb with her that day. I wasn't happy, but sent up a prayer that I wouldn't lose too much hair and thanked God that I had done some detangling on my own which limited the amount of damage inflicted. 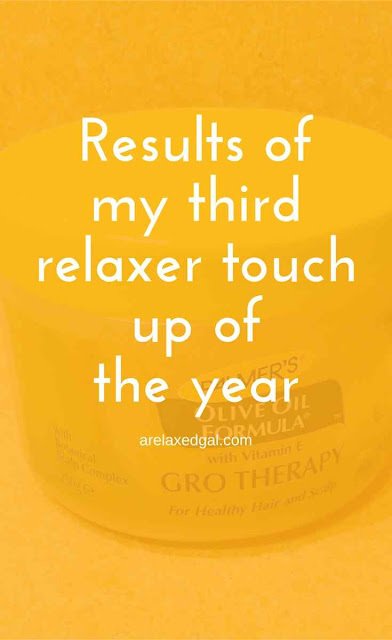 Next, she started applying the relaxer. We got to talking and she left it on a little longer than I would have liked (I take some the responsibility here). After rinsing, neutralizing, and washing she deep conditioned my hair using the steamer (which I really like). For my style, I opted to get a roller set to limit the amount of direct heat used. The stylist didn't have her larger rollers, so I had to settle for the medium-large ones. When she took the rollers out, the curls were a hot mess. She tried to make it look good which included using a flat iron on some sections and a ton of product so my hair felt weighed down (sad sigh). All in all, this visit took an hour longer than it usually does and I ended up being an hour late for my brother's event. What did I do with my hair? It's been in a bun ever since. Also, I realized after leaving that I didn't get the trim I asked for. Despite the beating my hair took with the small tooth comb, it looks like I retained some length. Though it's mainly on the right-hand side. What was your worst salon visit like? I am so sorry to hear about your salon experience! I have to say that my worst was when my sister still worked in a salon and did my hair. She always either put my hair into a super poofy style, or she trimmed it too short! I only trust my mom to do my relaxers, and I've been doing everything else concerning my hair. It's too important to me now to let anyone else risk screwing it up. Thanks for sharing! I've had some pretty good stylists in the past, but I'm more picky now that I'm more knowledgeable about my hair care. They can be. I've heard several nightmarish stories from my sister and friends. Thanks for reading. I'm sorry chica. My worst experience...well, there were few but ya know, I bounced back from all of them and so will you. (((hugs))) Your brother's band sounds lovely. Hey Leah! I have had so many negative experiences with salons so much so that I didn't visit a salon for a year!! Then I had THE WORST experience when I went to get a trim! I have turned into what I can describe as a "fussy" client as I have been on this hair journey. But I have the right to not have a set-back everytime I go to a salon!! I actually started looking for a salon via my local hair blogs and I finally found a salon that works for me. for your next visit: I always pack a wide tooth comb and heat protector in my bag when I go to a salon because these are show-stoppers for me and now I am thinking to pack my flexirods as well since no-one has big rollers. Thanks for sharing and the advice Kangopie. I'll be taking my own comb next time. Oh no Leah i feel your pain too. I know finding that perfect salon/hairdresser can be a mission. I am yet to go back to the salon scared as hell. But look on the bright side you know how to take care of your hair and you might as well nurse it back to its normal healthy state. Just some TLC and you re good. Thanks Curly Eva. It's so amazing how hard it is to find a good hair stylist considering all of the stylists that are out there. I definitely worked to nurse my hair back. This also made me even more picky about the people I let touch my hair!